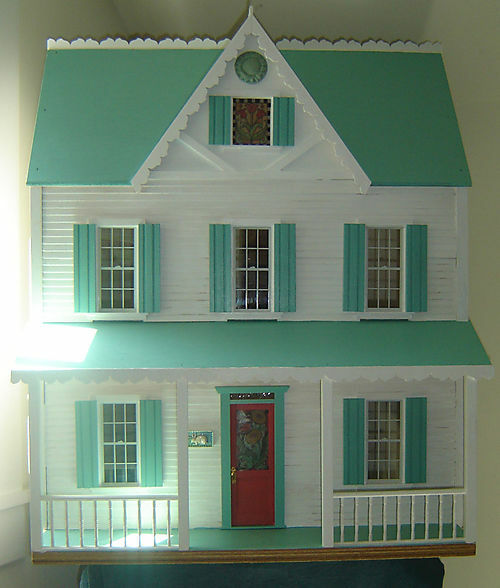 I bought this dollhouse at a yard sale a few years ago and it became my special project to trim it and paint it and decorate it. Though it's pretty simple, I love the architectural style-it's my favorite house shape. I painted the roof and the shutters my favorite color,but kept the house white because I love white houses. For the wife of an architect, a doll lover, artist and designer, it's the perfect studio mascot.